The South Korean government expressed their regrets concerning nine North Korean refugees (ranging in age from 20 to 70 years old) who were sent back to their country by Chinese Communist authorities. These nine refugees were trying to get assistance from a South Korean diplomat in Shenyang, a northeastern Chinese city, but were intercepted by Chinese officials. Many around the world are keen to the trend of refugees escaping North Korea only to be seized and returned by the Chinese authority. Li Tianxiao, a political science professor at the University of Columbia calls the CCP's repatriation of North Korean refugees an extremely inhumane practice. Li believes that China is working to gain favor with Kim Jong-Il's regime by returning escapees that might expose the crimes of the North Korean regime upon claiming safe asylum. China as well struggles to hide its own persecutory behavior that has produced many Chinese refugees, but has good reason to also protect North Korean interests—the country serves as a valuable ally against the largely democratic West. South Korean Diplomats arranged for the nine refugees to stay in a small hotel in Shenyang. The hotel manager, however, immediately reported these guests to Chinese authorities, resulting in their arrest and repatriation in October. Now these prisoners are being sent back to a North Korean detention center where they will serve their punishment. The South Korean Ministry of Foreign Affairs office declared, “The government expresses sincere regret. Even through our efforts we were unable to receive the relatives of war prisoners into our territory. We've learned a lesson from this incident and will work even harder to assist war prisoners and their relatives a safe return home.” Ministry of Foreign Affairs also confirmed that there are a large number of North Korean refugees in Shenyang. According to the Korea News Monthly report, the South Korean Consulate in Shenyang was earlier criticized for failing to appropriately handle the case of a South Korean fisherman escaping from the North. The fisherman had contacted the consulate for help but saw no assistance. Due to a vast spread of land mines and a heavily guarded military checkpoint between North and South Korea built at the close of the Korean War more than half a century ago, few North Koreans have successfully escaped to the South. The only other way to leave North Korea is a treacherous journey across the Boundary River into China. Thus, many North Korean refugees end up in China. The CCP has a long history of returning these refugees, which often results in their arrest and even execution. The CCP labels these fugitives as looking for employment opportunities in China rather than escaping governmental persecution. CCP critics point out that the Chinese regime not only refuses asylum to North Koreans, but also forbids UN Refugee High Commissioners' Office in Beijing to investigate. They also do not allow these refugees to contact international organizations. Such behavior is in violation of the international treaty that China signed. 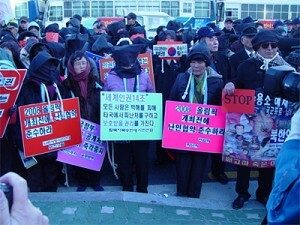 The CCP's repatriation of North Korean refugees was condemned internationally. On Jan 2, “Korea Freedom Union” and other NGOs supporting North Korean refugees, protested the CCP's decision, which led to the arrest, and execution of individuals fleeing North Korea. The protest organizer explained that the demonstration took place in 13 cities around the world. He claims that if the CCP's policy doesn't change, they will stage further protests, strategically focusing unwanted attention on Beijing's upcoming Olympics.